This is the reflector enhancer epoxy color chart. Reflector enhancer epoxy is our very popular decorative epoxy flooring system. Reflector enhancer gives you a floor that looks something like stained concrete but with its own unique effects. All reflector enhancer epoxy flooring systems are fluid when applied on site making them a seamless flooring system. These floors are very durable, tough enough to withstand vehicle traffic but beautiful enough to be applied to any interior setting. 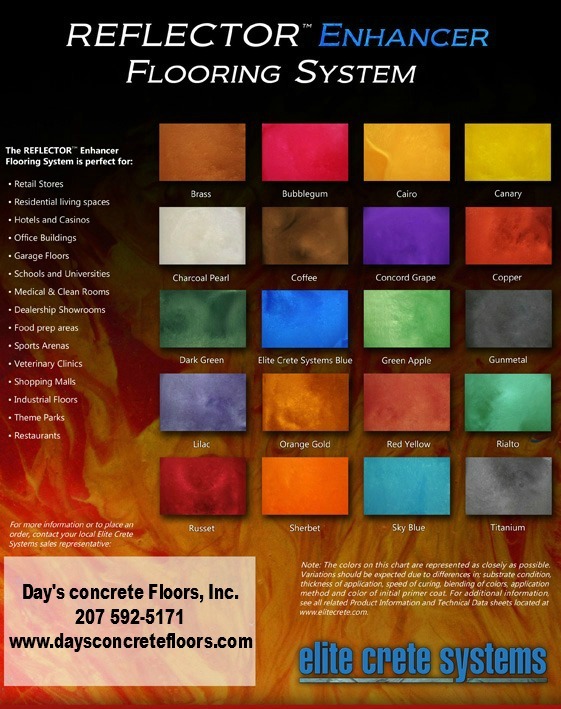 These are great looking floors for commercial or residential applications. If you would like to know how much a reflector enhancer epoxy flooring system would cost, you can request an estimate and I will contact you to set up an appointment.